We're still 6 months away from the Red Dead Redemption 2 release date, and Rockstar is winding that hype screw even tighter. Today it's released the third trailer for its forthcoming Western epic, and it's got us all champing at the bit to grab our stetsons, saddle up and ride out into Rockstar's lush-looking cowboy-themed open world. 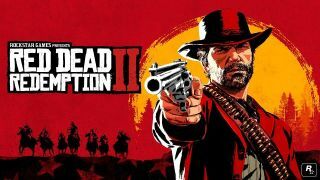 Again, there's little gameplay to be gleaned from the trailer, which instead focussed on showing off the cinematic ambitions of the Rockstar team – we're shown steam train hold ups, wagon theft and even a fiery burlesque show, with the unstoppable spread of flame a metaphoric theme throughout the trailer. We also get a closer look at Dutch's gang of misfits and criminals, tearing through the old West as the sun sets on the age of the cowboy and outlaw. Bonus points if you noticed John Marston with his trademark scars still fresh wounds. We know John was a member of Dutch's gang so it shouldn't be too much of a surprise to see him in the prequel, but we wonder how much of a major player he's going to be. Red Dead Redemption 2 is available for pre-order now for PS4 and Xbox One, but hold your horses – you'll have to wait until October 26 2018 for its actual release.